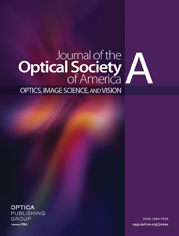 An iterative phase-estimation method for the calculation of a specimen’s phase function or optical-path-length (OPL) distribution from differential-interference-contrast (DIC) microscopy images is presented. The method minimizes the least-squares discrepancy measure by use of the conjugate-gradient technique to estimate the phase function from multiple DIC images acquired at different specimen rotations. The estimate is regularized with a quadratic smoothness penalty. Results from testing the method with simulations and measured DIC images show improvement in the estimated phase when at least two rotationally diverse DIC images instead of a single DIC image are used for the estimation. The OPL of a cell that is estimated from two DIC images was found to be much more reliable than the OPL computed from single DIC images (which had a coefficient of variation equal to 15.8%). a K is the number of rotationally diverse images used for the phase estimation, and γk is the angle the shear direction makes with the horizontal axis.